The chassis layouts of the 1/10th scale Rally & Slash 4×4 changed the original design of the stock nerf bars, making our currently available #80622 & #80625 nerf bars unusable with these models. 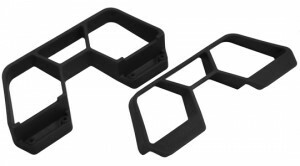 Our LCG nerf bars fix that problem and are a direct, perfect fit! RPM LCG Nerf Bars have added structural support to help strengthen the body and reduce impact forces transferred to the chassis. The additional cross bracing optimizes the rigidity while absorbing additional impact energy anything less than RPM would have crumpled under! RPM Nerf Bars are stock replacement parts and work with all stock Traxxas chassis running Traxxas #7423 nerf bars. RPM Nerf Bars are proudly made in the USA, molded in either blue or black from our engineering grade nylons and backed by our limited lifetime warranty against breakage.